Statement necklace by INC International Concepts, $30. 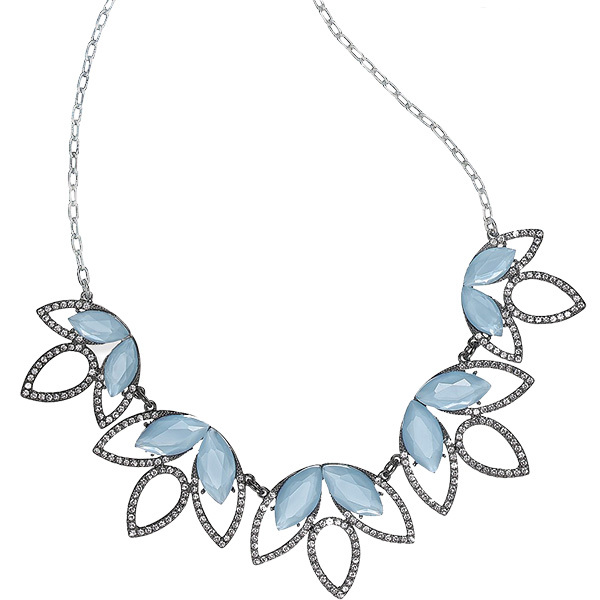 Crystal necklace by Touchstone Crystal by Swarovski, $75. Star drop earrings by BaubleBar, $36. Silver crystal earrings by Simply Vera Vera Wang, $26. Rose-colored crystal and gold earrings by Pandora, $65. Double-hoop crystal earrings by Berricle, $60. Cluster earrings by Carolee, $40. Bracelet by Touchstone Crystal by Swarovski, $89. Pearl and crystal bracelet by Olive + Piper, $34. 12k gold-plated and enamel bangle by Kate Spade New York, $48. Rose-colored watch and bracelet set by Armitron, $90. Oval-cut crystal cocktail ring by Adrianna Papell, $50. Crystal sash by David’s Bridal, $40. Floral bun pin by Kitsch, $18. Clear and white opal headpiece by Chloe + Isabel, $88. Silver slingback heel by Jewel Badgley Mischka, $89. Champagne satin heel from Touch Ups by Benjamin Walk, $85. Clutch with crystal-closure accent by Nina, $75. Acrylic clutch by La Regale, $88.